Pardon the long post as I catch up on my book lists for the year. Even with all the major life-events going on around here, I've been delighted with so many good books the last couple of months. Maybe you'll see something here to add to your own reading list? I'd love to hear about it! See the (updated) Giant List of What I'm Reading in 2016. An excellent, excellent book by the inimitable Mary Karr. Up to this point, I've only read one of her memoirs (Lit), and upon finishing The Art of Memoir immediately pulled two others from my library (The Liars Club and Cherry). This book will go on my shelf next to Annie Dillard's The Writing Life, Stephen King's On Writing and Anne Lamott's Bird by Bird. It's that good. In my opinion, it might be even better. "After a lifetime of hounding authors for advice, I've heard three truths from every mouth: (1) Writing is painful -- it's 'fun' only for novices, the very young, and hacks; (2) other than a few instances of luck, good work only comes through revision; (3) the best revisers often have reading habits that stretch back before the current age, which lends them a sense of history and raises their standards for quality." "Real You is all you have, and all other paths are false. And in the best case, Real You is so happy to finally be recognized, it rewards you with Originality." "Charm is from the Latin carmen: to sing. By “charm,” I mean sing well enough to hold the reader in thrall. Whatever people like about you in the world will manifest itself on the page. What drives them crazy will keep you humble. You’ll need both sides of yourself—the beautiful and the beastly—to hold a reader’s attention." 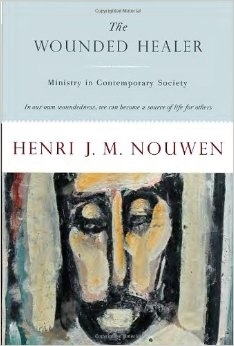 This is not my favorite of Henri Nouwen's - which surprised me since it is considered one of his best. I couldn't help but feel that, while all he wrote on compassion for those we serve in our churches and communities rung as simply true, Nouwen's broad generalizations of the people we were called to serve rung simplistic and dated. Maybe this is just my own youth and inexperience showing. Either way, a call to compassion for those lost in lives of searching-but-not-finding is an important call to all of us. “The great illusion of leadership is to think that man can be led out of the desert by someone who has never been there." I bought this while we were (delightedly) stranded in Brooklyn in February. I'd had several people recommend the title to me, but never taken the time to track it down until I stumbled on it at Greenlight Bookstore. I'd call this a writing pep-talk sort of book, which deserves a special place on my bookshelf. Goldman is unabashedly enthusiastic about writing, come hell or high-water, with no fear, no shame, no inhibitions. Be aware of (the especially female) tendency to add qualifiers and indefinite modifiers (e.g., perhaps, maybe, somehow). Make clear, assertive statements as a "practice in trusting your own mind, in learning to stand up with your thoughts." Find a weekly writing partner like Natalie's friend, Kate, who met her every Monday to write together all day long. Such an important, classic book from a man who both thought a lot about theology and lived a lot of pain. This is a book I need to read at least once a year. "It is not simply that God has arbitrarily made us such that He is our only good. Rather God is the only good of all creatures: and by necessity, each must find its good in that kind and degree of fruition of God which is proper to its nature. The kind and degree may vary with the creature's nature: but that there ever could be any other good, is an atheistic dream. George Macdonald, in a passage I cannot now find, represents God as saying to men, 'You must be strong with my strength and blessed with my blessedness, for I have no other to give you.' That is the conclusion of the whole matter. God gives what He has, not what He has not: He gives the happiness that there is, not the happiness that is not. To be God - to be like God and to share His goodness in creaturely response - to be miserable - these are the only three alternatives. If we will not learn to eat the only food that the universe grows - that only food that any possible universe ever can grow - then we must starve eternally." A great primer for anyone wanting to better understand the liturgical year, and especially for those with young families. For each season of the Church calendar, the authors provide a brief history (including the connections to the Jewish feasts), traditions from around the world, Scripture, symbols, recipes, activities, recommended reading and more. Because I not only like to read books about books, but I also like to make lists about books, I took it upon myself to create a bookshelf on my Goodreads page that holds all the titles Peterson recommends in Take & Read. I consider it my lifetime goals bookshelf. "Spiritual reading, for most of us, requires either the recovery or acquisition of skills not in current repute: leisurely, repetitive, reflective reading. In this we are not reading primarily for information, but for companionship. Baron Friedrich von Hügel once said it was like sucking on a lozenge in contrast to g ulping a meal. It is a way of reading that shapes the heart at the same time that it informs the intellect, sucking out the marrow-nourishment from the bone-words." So here's the thing, I'm not good at liking what everyone else likes at the same time that they like it. I'm serious. Inevitably, I love some band or movie or book about two years ahead of everyone else or approximately 5-100 years after everyone else has forgotten about it. What I'm trying to say is that it's not you, it's me. While I thoroughly enjoyed the vivid descriptions Doerr crafts (particularly and appropriately in helping me read with all of my senses beyond vision), I didn't really love this story. It was enjoyable, but felt a bit long, with a disappointing ending. Don't take my word for it, though. You will probably love this book! Here. Take this blogger's word for it: A feast of a book at Gladsome Lights. I loved her reflection after reading All the Light. "I have been feeling very clearheaded lately and what I want to write about today is the sea. It contains so many colors. Silver at dawn, green at noon, dark blue in the evening. Sometimes it looks almost red. Or it will turn the color of old coins. Right now the shadows of clouds are dragging across it, and patches of sunlight are touching down everywhere. White strings of gulls drag over it like beads. It is my favorite thing, I think, that I have ever seen. Sometimes I catch myself staring at it and forget my duties. It seems big enough to contain everything anyone could ever feel." Another book and author, I risked (because of my general contrarian afflictions) not loving because it feels like everyone is talking about her. I used a free trial Audible.com credit to listen to the audio book and discovered - to my relief - to be duly impressed. I'm especially grateful for the way Brené Brown approaches the subject of vulnerability. Here's a link to a collection of quotations from the book on the unlikely gift of vulnerability. "As I look back on what I’ve learned about shame, gender, and worthiness, the greatest lesson is this: If we’re going to find our way out of shame and back to each other, vulnerability is the path and courage is the light. To set down those lists of what we’re supposed to be is brave. To love ourselves and support each other in the process of becoming real is perhaps the greatest single act of daring greatly." I read Lit - considered Mary Karr's third memoir - a few years ago, when I borrowed it from my friend Micha (a former student of Karr's). I'd held off reading her highly-acclaimed first two memoirs - The Liars' Club and Cherry - because I was nervous about reading the details of Ms. Karr's upbringing, which she alluded to frequently in Lit. I'm not usually too squeamish when it comes to reading memoir account of painful childhoods, but I think I recognized quickly that Mary Karr's story told in her wry, gritty voice might actually be too much for me to handle. I'm glad I changed my mind. It's not so much that my assessment was wrong, but it didn't account for the humor and light touches of deep love and forgiving grace. Karr's ability to tell the plain truth about her seriously-flawed parents (a short list: alcoholism, neglect, suicidal threats, and attempted murder), she simultaneously draws us toward her family with empathy and mercy. In other words, she describes her family members as truly human, rather than monstrous caricatures of themselves. In the end, this book will move onto my all-time favorite memoirs. Once I got started on Mary Karr's account of her life in The Liars' Club, I didn't want to stop. Cherry is the sequel memoir, telling the story of Ms. Karr's adolescence. The author's voice is as strong as ever, and the cast of characters as interesting. I especially enjoyed the nuanced descriptions Karr gives of her relationships with friends. As a reader, I am so glad this lonely girl had friends, but I also appreciated the truth the author tells in the very real, if sometimes subtle, streaks of codependency that color even the best of high school friendships. Once again, Ms. Karr refuses to romanticize the characters in her life story. If she gets close at any point it is with the motley crew of friends she travels with during her late teen years. This was my least favorite part of any of her memoir writings - it felt a bit rushed, and, perhaps, the least internalized. I suspect the sort of "unreal" quality of the writing could be the result of the drugs? In all, I'd recommend every single thing Mary Karr writes. Her story - and the broken-but-being-healed voice in which she tells it - is a gift to all of us trying to make sense of our own lives. Kids in distressed families are great repositories of silence and carry in their bodies whole arctic wastelands of words not to be uttered, stories not to be told. I've lost track of the number of times I've heard the Wolff brothers (Toby & Geoffery) referenced by authors I admire. It took reading The Art of Memoir (Karr) which prominently features examples from both of the Wolffs' memoir-writing prowess -- and realizing I'd have the opportunity to hear Tobias Wolff speak in person -- that finally got me me to read This Boy's Life. Neither did the plenary session given by Mr. Wolff at the Festival of Faith & Writing. Tobias Wolff's ability to write a character is a beautiful thing to read (and to hear, as he read for us at the festival). His brilliant ability to not take himself too seriously, while taking others in his story seriously is a model for us all. I am so sad for the suffering he endured (particularly from his narcissistic stepfather). There were parts of his story - the parts where he was emotionally abused, even more than the physical - that I could have closed the book and wept for every scared boy trying to "man up" for the love of his lonely mother. I happen to know a man like that, and knew him in the midst of some similar pain. I remember being 14 years old, dialing his number from my harvest gold rotary phone, praying to God that the bully of a stepfather wouldn't answer the phone. Perhaps my favorite discovery of Tobias Wolff happened at the festival, at the end of a long day in which I'd heard him speak in the morning. I was outside the main building waiting for my hotel shuttle, and Mr. Wolff and his wife were dropped off by a private car to enter the lodge. He was walking toward the door with what can best be described as a bounce, kind of springing off the balls of his feet, grinning from ear to ear beneath the iconic white mustache. I heard him say to his wife as he reached for the glass door to pull it open for her, "These are such wonderful people, aren't they?" And I gave thanks to the God who gives little abandoned boys these reservoirs of childlike joy that go on to bless us all. God bless you, Toby Wolff. "Fearlessness in those without power is maddening to those who have it." It may be that I read this book in one of my most vulnerable moments. It may be that I had a writer-crush on the author. It may be that the elegantly-crafted memoir is truly that good. And it may be all three. It doesn't matter to me the reason; I just thought you might want to know. In any case, I recommend Roots and Sky without reservation - for it's story (a young family of 6 moving several times until finding just the right home and place in beautiful Pennsylvania), for it's beauty (the sort maybe best understood with the author's blog as a photographic companion), for it's pain (infertility, loneliness, exhaustion), and for it's simple joy (the daily flora, fauna, house repair and neighbors found in the four seasons surrounding the new home). So, picture me propped up in a fairly uncomfortable hotel room on a commercial strip of mini-malls near the Grand Rapids airport - book in one hand, glass of wine in the other. I'd walked a mile and back to the nearby Trader Joe's for that glass of wine. A bit later, I would spill half of the bottle on the white sheets, and laugh hysterically imagining the stories the hotel maids would tell the next morning. But for now, I'm hushed by the insecurity of a day navigating a new world of writer's conferences. I'm 45 years old, which is embarrassingly old to be a writing world virgin, and the flush on my self-esteem tells it. I'd been jilted more than a few times my first day, trying to introduce myself to writers and bloggers I'd admired from a distance. There were the warm welcomes, too, not the least from Christie Purifoy. I sit in a circle of classroom desks, conscious of the way my four-birth-expanded hips squeeze into seats formed to the size of an average college student's arse. The room is full of other aspiring writers, and led by a gracious, soft-spoken Purifoy. I'd shown up to this group called the From Blog to Book Writing Circle with a encyclopedia-sized chip on my shoulder. It grows each time I recognize that the largest credential on my resume is blogging for 10 years, and that now blogging - as these things tend to do - has cycled itself to a sort of outcast place in the writing world (of course, in the traditional writing world, blogging has always been scoffed). The chip on my shoulder gets nourished by hearing from bloggers-become-authors, as well as authors that get publicity from bloggers, wonder aloud about the value of blogging. To me in this stage of life, it feels kind of like blogging has become the blue-collar-working parents of the writing world - launching plenty of overachieving offspring who go on to do everything in their power to forget the origins of their own success. Totally overdramatic, I realize. That's how shoulder chips retain their weight, after all. So, I attend the writing circle, and right away, in this room, my ten years of blogging seems to mean something. I want to hear the book part of the promised equation, though. I want to know does it matter if we write books? Should I want to write a book? Some of the group conversation addresses these questions, but nothing comes close compare to reading Purifoy's book for itself. Cue back to me in the hotel room with the glass of wine, opening the binding of Roots and Sky. I read until 4 AM, and in my reading I remember there is an elegance to the written page that cannot be captured in even the most aesthetically-pleasing blog template. There is a weight to words that can live on a concrete bookshelf, rather than a virtual one. There is a discipline to word count, and verb tense and punctuation that carries an authority greater than even Google's almighty search algorithms. So, reading the book for itself answered my pressing questions. As for the writing insecurity, there will be time and training to address that. What I needed most from the festival circle was an answer to the question "Why write a book?" Reading in my hotel room, turning pages from sundown to near-sunrise, answered my big question. And, perhaps, it could have been any blogger/author leading that circle would have had the same impact. Maybe I could have been reading any number of the quality books published by bloggers-turned-authors, and have had the same experience. But it was this book -- the one about finding home after searching in cities across the country, about missing a place with four seasons, about living in a place that seemed like a dream-come-true and discovering it felt more like a wilderness wandering -- that brought better comfort than even sleep in a king-sized bed. It was this book by Christie Purifoy that converted me. I'm not just a writing conference newcomer, old enough to be jaded, inexperienced enough to be unseen, sitting in that hotel room. I'm also a mom right on the verge of saying goodbye to the youngest of my four children. I'm a homemaker looking for a rental house across the country from the big, bright city we've lived in for five years, facing a whole new chapter of work and home and church and neighborhood. I'm a woman feeling sheepish that one of the country's coolest cities was not the right fit for her four-season-loving soul. I'm a friend ready to leave some of the best a person could find, 1,700 miles behind. I'm lonely. I'm afraid. I'm sad. I'm embarrassed. I'm lost. And I read Roots and Sky and remember my own. Not only remember, but through the gracious voice of the author, feel affirmed in my need to live in a place with the same contours as the geography of my soul. I'm an aspiring flower gardener, brought to tears with passages like this: "Next to come were a few seed packets of zinnias, cosmos, sunflowers, and marigolds." Two years before our arrival at Maplehurst, we had left the Midwest eager for new jobs, milder weather, and a house of our own with a real backyard. We were unprepared for the enormity of our losses. Good friends. Close-knit community. A meaningful connection with the work of our minds and our hands. There was one lost thing, in particular. It was such a natural part of our prewilderness lives that I only ever recognized it after it was gone. In our northern city, we had lived a seasonal rhythm of summer festivals and winter sledding, spring baseball games and autumn apple picking. Our moments and our months were distinguished by the color of the trees, deep red or spring green, and the color of the lake, sparkling and playful in summer, menacing and dull in winter. These things were the beautiful, sometimes harsh, but always rhythmic backdrop in our days. Time was like music. It had a melody. In the wilderness, the only thing that differentiated one season from the next was my terrible winter asthma. Without time's music, I became aimless and disconnected, like a child's lost balloon. All along I'd assumed my discontent with Austin weather was a fatal flaw in me, a wimpiness, an ingratitude. To be sure, it was a good calling to pay attention to all that is, indeed, beautiful about Texas skies and wildflowers and purply springtime. To understand it might not be a spiritual deficit on my part to physically ache for the rhythm of seasons is a life-altering blessing found already on page 18. Certainly, I would follow Christ with a glad heart if he made a place for us here in Texas, with its two sunny seasons. But to know that He might call us - place us even - in a city that embodies all of our favorite geographical offerings in the Northeast, I can receive that with unembarrassed joy. It seems that we, like Jesus before us, will know trouble and displacement. We will be called away from so many great loves: love of family, love of our familiar fields. But we will also be tasked with the work of cultivating new homes and new fields and new relationships. We will wander. We will come home. But always we will follow. In summary: I devoured the images of seasons and flowers and trees and sky and neighborhood the Purifoy crafted on every page. As I read her words, I kept thinking of the biblical invitation "In quietness and confidence is your strength" as the best description of my encounters with Christie -- in her book and in real life at the conference. I am grateful to the Father for this gift - and to her, also. Christie Purifoy's story of making home in Roots & Sky kind of blindsided my expectations for what I would discover at the Festival of Faith and Writing. I headed back to Austin with the realization that as much as I am hoping to be developed as a writer, I am longing to be re-planted as a maker of home. I do not know how to do either of those things in this new season, but I've decided to start (again) with a few of the words Christie spoke in our Writer's Circle, "If these things are given over to God..." and "The only place your book is going to come from is deep inside...."
It turns out that the ground deep inside holding my dreams is made of the rain-and-snow-soaked Northeast soil. We must plant our dreams in real earth. We must dirty our hands. It's the only way. Whether we dream of planting flower gardens or churches, ever dream needs a place in which to take root and grow. Every dream needs a home. Go to my Book Pile page to see my reading lists from 2015 and previous years.